I’ve been very fortunate to work with some amazing musicians. Drummers, percussionists, and other players have made the job of creating music a shear delight. On the other hand, there have been moments of extreme frustration when a musician was not grooving or connecting with the band. It could be a technical problem. Like a player not keeping good time, playing too loudly, or not playing the proper part or style. Sometimes it’s an emotional thing. Like someone thinking too highly of themselves (arrogance) or just not caring about what they are doing (boredom). Either way it makes for a bad day for the band. For a drummer and percussionist to work together well, every aspect has to be in place. Both players must really be “locked in” to the tempo. Dynamically, they need to sound like one unit. Their parts must be carefully arranged to work well with each other, and to compliment the rest of the group. And it helps if they have at least a good working relationship, if not a real friendship. I’ve heard percussionist say that their drummer doesn’t play well and that they HAVE to over power them to make the music work. That could be true, but my first recommendation is to work it out first. Get with your drummer and start practicing with a metronome, or drum loops. Communicate with each other. Build a relationship where you think as a team, and learn to help each other. Music never seems to feel really good when there is a musical or personal battle on stage. *More on this later. I can always tell when the percussionist is NOT listening to what the drummer or the rest of the band is doing. The part they play might conflict with the hi-hat or ride cymbal part. Maybe they are playing too busy. Filling every space with some sound effect or percussion fill is like having too much salt in your soup! In a case like this, I will actually have a little chat with my drum/percussion partner. I always try to be an encourager. It never helps to yell at someone or project negative emotions into the environment. There is a spiritual lesson here, but for the sake of time, let’s just focus on the technical stuff. I will actually discuss with the percussionist about how we arrange our parts for the music we’re playing. I might ask them to NOT play for a section. Maybe they should just color the 1st verse and chorus with sound effects, and not do any “groove” parts until the 2nd verse. It all depends on THE MUSIC! What does the music really require? If there is a recording, both players should be copying what was already “composed.” Yes, I think of recorded music as a composition. Unless the leader asks for some other interpretation, play the part that already exists for the song. This is always my “default setting” for playing music. If we are creating a part for a song I listen very carefully to what the rest of the band is doing to try to find the drum part. Then the percussion concepts should fit into that. Yes, there are times we might build from a percussion idea first. Percussion grooves are everywhere in contemporary music. Even more so now with the use of drum machines, drum loops, and sequencing. So it is a great time to be a drummer and percussionist, but ALL of the musicians must be serving the song. If what we play does not make the song work well, it’s just noise! When setting up I prefer the percussionist to be on my right side and the bass player to my left (the hi-hat side). This allows for the percussionist to hear the kit clearly and to have a visual connection to my right side. For me, the right hand will be dictating a lot of the time keeping (hi-hat & ride cymbal patterns). I’ve always found this helpful when setting up a drum and percussion duo in the band. It is definitely my preference when playing percussion. When that’s not possible, I still make sure I have a good sight line to the drummer, and I’m very careful about getting a good monitor mix. You have to hear well to play well. I mentioned earlier about keeping a positive atmosphere. There should be no personal or musical battles on stage. Make sure you are communicating well with the percussionist or drummer. CAN WE TALK?! Commit together to serve the music and the other players to the best of your abilities. If you can’t agree on what you’re playing, always use the original recordings as a reference. Also, be sure the worship leader or artist is happy with what they are hearing. It is NOT about you! Never think about getting noticed or trying to “be cool.” If you are playing great music, and striving to make the whole group sound great, you will automatically gain the respect of everyone. A great tool for checking out your sound is to record everything you play. I’ve mentioned this in other drum articles, but it is really true for every player. As a percussionist, you can get a true perspective of what you sound like when hearing the recording from any event you play. Be objective when you listen and decide if what you’re playing really works with the music. If not, be mature enough to make the proper adjustments. You might notice your shaker or tambourine patterns don’t line up or “groove” well. Listen carefully! Do you need to push your time more or layback to make the music feel good. Are you too loud or too soft? Do you need to leave out some ideas because there is just too much going on? Hearing a recording of yourself is one of the most educational tools you can use. Be brave and do what ever it takes to improve your work. One practical thing I look for in a percussionist is the way they angle the shaker or tambourine. The more perfectly level you play a pattern with these instruments, the more even the rhythm will sound. If you use more of an up and down hill kind of stroke the rhythm will swing more. Try it next time you practice. Take a shaker and play a simple pattern as evenly as possible. Notice the more you point your stroke towards the floor the more “uneven” or “swinging” the pattern will sound. Then come back to a perfect horizontal stroke and listen to the difference. This simple exercise well help you learn to control the feel of your groove. Try this also with a tambourine. It’s an “eye opening” experience. Another common percussion mistake is to use the wrong style of grooves with the music you play. 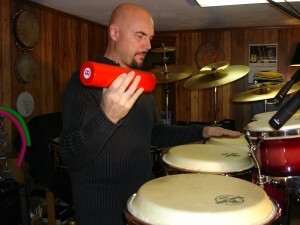 If you play real legit “Latin” percussion patterns in pop or rock songs, they may not fit. Even if you play them perfectly, they still may not work with the music. Again, the contemporary percussionist must know how to blend all of the styles they know and find just the right “musical” concept to fit with what the song requires. You might have to play some very strange combination of instruments or patterns to create the right vibe. Developing your drum & percussion team into a great music machine will make you an honored duo in your band. Stay humble and focus on making the music sound great and you will never be accused of being a two-headed monster. You can truly be proof that two heads are better than one. 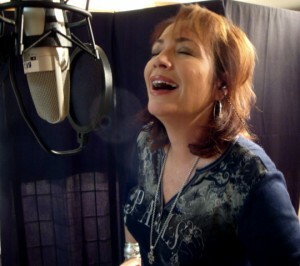 Capturing a great moment of worship in the studio. Thou shalt not play your drums in vain! Anyway, the meshing of drum grooves with great melodies, guitar riffs, piano vamps, and of course, great bass patterns, always inspires me. It was the drums as part of great songs that made me want to play. And so it is today. I’m drawn to great songwriting and arrangements more than drum solos. Although there are a lot of drum records in my collection now. So who were those early “ear grabbers.” Well on the recording of “Pretty Woman” was Buddy Harmon who has played on thousands of great recordings. There’s also Hal Blaine who was part of “The Wrecking Crew” in L.A. A nickname they were given by the “legit” musicians of the day because it was said these young studio musicians would wreck the music business. His credits also list in the thousands. I use to sit down and play along with tons of records (*yes, vinyl) that Hal recorded. “Classical Gas”, “Close To You”, “Galveston”; I know they’re just pop hits, but that’s what I grew up on. There’s also Jim Keltner, John Guerin, John J.R. Robinson, Russ Kunkel, and,,, OH,, I know I’ll forget some because the list is huge! Oooo,,, YES!,,, Jeff Porcaro definitely ranks up there as a favorite. I would buy recordings just because I’d see his name in the credits. All of those great Toto records, Boz Skaggs, Steely Dan, and many more fantastic performances. It was a sad day when he passed away. I still remember it. It was also the same year we lost another great drummer; Larrie London. I was sad for days when they died. And I didn’t even know them in person. Just their influence and inspiration made me feel like I was part of the great family of drummers. 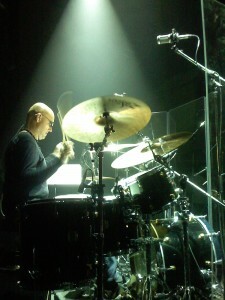 Manu Katche, Steve Smith, Greg Bissonette, Phil Collins, Ricky Lawson, and the list goes on and on and on. Oh, wait,,, I can’t forget,,, OH MY GOSH! !… Vinnie Colaiuta, Steve Gadd, and Dave Weckl… Pause!!! .. You can’t see me,, but I’m shaking my head in amazement!! These guys are unbelievable!! Oh yea!!! I want to go put on a CD now just to listen to them. Crash! Slam! !… Bah da Boom!!!!!!! The point I’m trying to make here is that you should be influenced by many artists. Don’t fall into the trap of listening to only one player or style. I’ve seen drummers so obsessed with one type of player that they are limited in their ability to play in different settings… which is an absolute “must” for a musician today. Besides your Rock and Pop records there should be other things in your collection. Listen to the jazz greats like Elvin Jones, Tony Williams, Max Roach, and Roy Haynes. Latin icons like Tito Puente or Alex Acuna. Check out some country music with Eddie Bayers, James Stroud, or Paul Leim. Paul can also be heard on tons of pop hits as well as some of your favorite Christian recordings. The great drummers you hear on Christian music is an extensive list of its own. Steve Brewster, Scott Williamson, Mark Hammond, Dan Needham, and John Hammond are just a few of the players that have laid the foundation to the music that you are probably most familiar. When I first got saved in college my first Christian record was Keith Green’s “For Him Who Has Ears to Hear.” Bill Maxwell was the drummer on all of Keith’s records as well as many Andre Crouch albums. 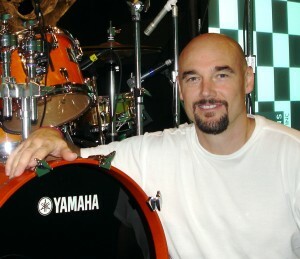 He became my first mentor of drumming for Jesus. Then there was Alex Acuna, Bob Wilson, and Keith Edwards and the others I’ve mentioned. It’s been an honor through the years to work with some of my drum heroes. The main thing I’ve noticed is not only were they gifted players but also humble people. I believe that many talented people know that their skill is a divine gift. There are so many great drummers. To pick a favorite would be impossible… well, at least for me. Through the years I realize my list just keeps getting bigger and so should yours. So go out and add some stuff to your collection that will expand your musical horizons. A good way to start is to buy a greatest hits CD of a certain artist or era. You know, one of those “K-tel presents” series or a Rhino Records compilation. I recently purchased one of Stevie Wonders Greatest Hits collections. Not every song was exciting for me, but it was a great study in the development of his talent. That’s what it’s all about. Learning and growing. Being faithful to the talent the Lord has placed in you. 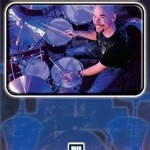 Also check out Modern Drummer Magazine or www.moderndrummer.com and see what’s going on in the drum community. It’s the best reference I’ve seen for what drummers need to know and learn. You can also buy videos or DVD’s of so many great players. They share their skill and insight in a lesson format rather than just watching them in concert. Although that can be very educational as well. Again the main idea is to keep expanding your musical vocabulary. I’ve been working on new tunes with Quad Venti – the pop jazz group I work with. Dave McKay-keys, Gary Lunn-bass, Mark Baldwin-guitars, & “yours truly” on drums & percussion. We’re taking our time writing & re-writing tunes so the material feels right to everyone. We’re challenging each other in a good way… can’t wait to hear the results. We’ve tracked about four tunes so far. *In this video we’re on a little tech break because the recording gear (a laptop) would not cooperate… BUT I think it was pilot error! 🙂 I’m a better drummer than an engineer. Keep us in your prayers as we “dig for gold” in our musical world. This short video shows that there are always creative options to the basic tuning approach. We were trying some kick tuning options on this Paul Baloche session. Get the “The Beginning Drummer” DVD for a complete demonstration in drum kit tuning and other basic drum techniques. Go to my STORE to buy on line. Enjoy a private drum lesson from anywhere in the world! 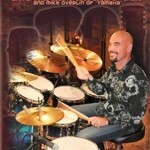 Contact me for drum lessons via Skype or iChat; or at events when I travel; or here at my studio in Nashville. Please check my schedule for a city near you. You can reach me on Facebook, email (LMAlbrecht@aol.com),or my phone – 615-851-2850. I look forward to helping you on your drum journey. You may see pictures or video of me playing other drums at events. That’s usually because Yamaha drums are not available. My endorsement deal is pretty good… but sometimes it’s tricky to get the kit I’ve requested. After all — I’m NOT Steve Gadd… I understand that. And it’s all cool with me… Yamaha treats me very well. Endorsements are about relationship, and I’m super grateful to the team at Yamaha for how good they treat me. My friend Mike Overlin of Yamaha has drum kits around the country available for events that we do that are to my specifications, and that blows me away. Bless you Mike. When things don’t work out, I’m totally flexible, and make things work with what I get. I always remember endorsements are a blessing & a privilege, not an entitlement. 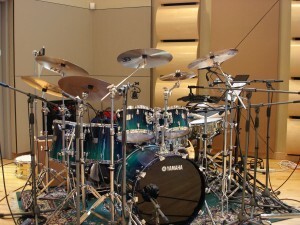 There are many great drum kits that work very well; it’s just different. AND, it’s a good opportunity to experiment. 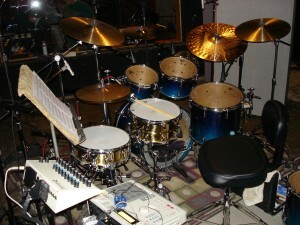 Anyway, much of the sound of a drummer is drumhead selection, tuning, sticks, and the technique of the player. Of course microphones, mixing, and other technical issues come into play. So, there you go… I’m not changing drum deals… but, yes, you may see me on other equipment from time to time. Here’s my big kit in a Nashville studio. As you can see the 4th tom is added here. (10, 12, 14, & 16).